GUITAR (Fr. Guitare, obsolete Guiterne; Ital. Chitarra; Germ. Guitarre, obsolete Gittern, Ghittern, and Gythorn; Span. Guitarra). The Spanish guitar is the most generally known modern representative of the numerous family which includes also the lutes and cithers. The identity of the name with the Greek κιθαρα is not to be mistaken, but the resemblance of the Spanish and ancient Greek instruments is too remove to imply derivation. The guitar is at once known by its flat back, the sides curving inwards after the pattern of violins and other bow instruments, and suggesting its descent from some instrument to which a bow was used. The shape has however varied according to fashion or the fancy of the maker. The woods commonly used for the sides and back are maple, ash, service, or cherry tree, not unfrequently adorned with inlays of rosewood or fancy woods. Old instruments of the seventeenth century are often highly ornamented with ivory, ebony, tortoiseshell, and mother of pearl. The soundboard or face is of pine, and has a soundhole, which shares in the general decoration. Hard woods, such as ebony, beech, or pear-tree, are employed for the neck and fingerboard. The bridge should be of ebony, and has an ivory or metal 'nut' above the fastenings of the strings, similar to the nut of the fingerboard, the open strings vibrating between. Modern guitars have six strings, three of gut and three of silk spun over with silver wire, tuned as (a). The lowest is said to have been a German addition dating about 1790. 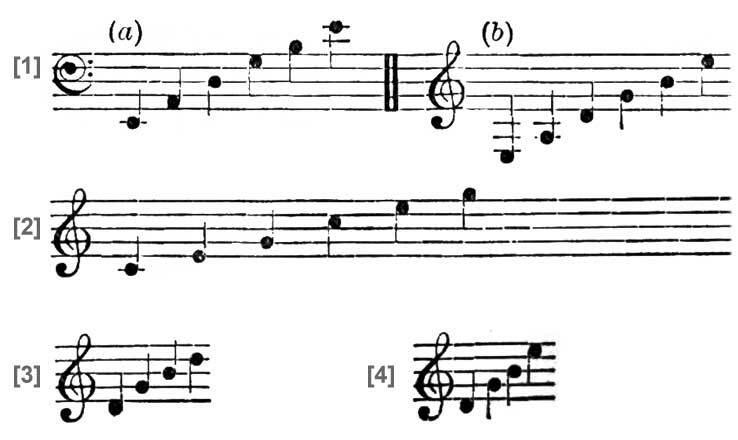 The written notation is an octave higher, as (b). Metal screws are now used for tuning, instead of the ebony pegs of the true Spanish instrument. The intervals are marked off by metal frets upon the fingerboard, and transposition to the more remote keys is effected by a capo tasto or d'astro. (See FRETS; CAPO TASTO.) Old instruments had often ten, twelve or more strings, arranged in sets of two, tuned in unison. The Spanish guitar is always played with the fingers. The deepest strings are made to sound by the thumb, the three highest by the first, second, and third fingers, the little finger resting upon the soundboard. The guitar and its kindred were derived from the East. In the famous Gate of Glory of Master Mateo, to the church of Santiago da Compostella in Spain, a cast of which is in South Kensington Museum, among several musical instruments may be seen one guitar shaped, which may be assumed to represent the original Vihuela, the old Spanish viol or guitar. The sides are curved, but there is no bow held by the player; still this is no proof that a bow was not used, since the sculptor may have omitted it. The date of this masterpiece (A.D. 1188) is perhaps not more than a hundred years subsequent to the introduction of the instrument by the Moors into Spain. Mr. Engel tells us (Musical Instruments, etc., 1874, p. 117) that a hundred years later than this date, there were several kinds of vihuela, to some of which the bow was certainly not used. There were instruments for the bow, the plectrum, and the fingers, all in use at the epoch of the outburst of romantic song in Southern Europe. At the close of the last century and beginning of this, the Spanish guitar became a fashionable instrument on the continent. Ferdinand Sor, a Spaniard, after the Peninsular War, brought it into great notice in England, and composing for it with success banished the English guitar or Citra (Fr. Cistre; Ital. Cetera; Germ. Zither). This was an instrument of different shape, a wirestrung CITHER, with six open notes, two being single spun strings, and four of iron wire in pairs tuned in unison. The scale of the English Guitar thus strung was written  in real pitch an octave lower. The technique of the instrument was of the simplest, the thumb and first finger only being employed, if not a plectrum. Sor's most distinguished rival was an Italian, Mauro Giuliani, who composed a concerto with band accompaniment for the 'Terz chitarra' or Third-guitar, an instrument with a shorter neck, tuned a minor third higher. This concerto, published by Diabelli, Vienna, was transcribed by Hummel for the pianoforte. Other popular composers were Legnani, Kreutzer, Nüske, Regondi, and the wayward genius Leonard Schulz. Berlioz and Paganini were both guitarists. There is also an octave guitar, the little Portuguese MACHÊTE, with four strings, tuned , or by guitar-players often . In Madeira, after work in the vineyards is done for the day, the country people return playing the Machête, perhaps twenty together, with occasionally a larger five-stringed one accompanying.